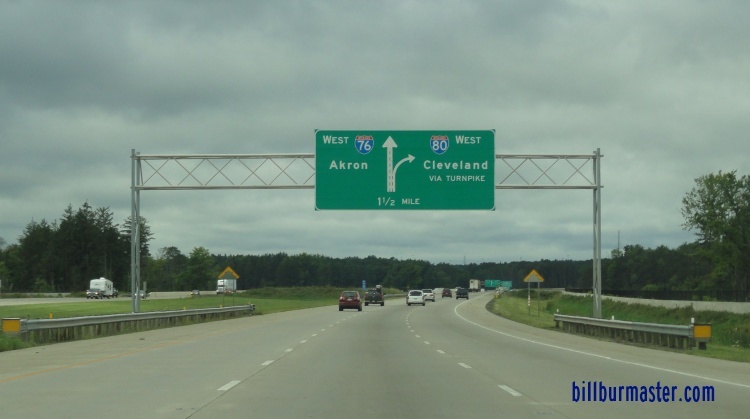 Interstate 76 is a east-west highway across Northeastern Ohio. 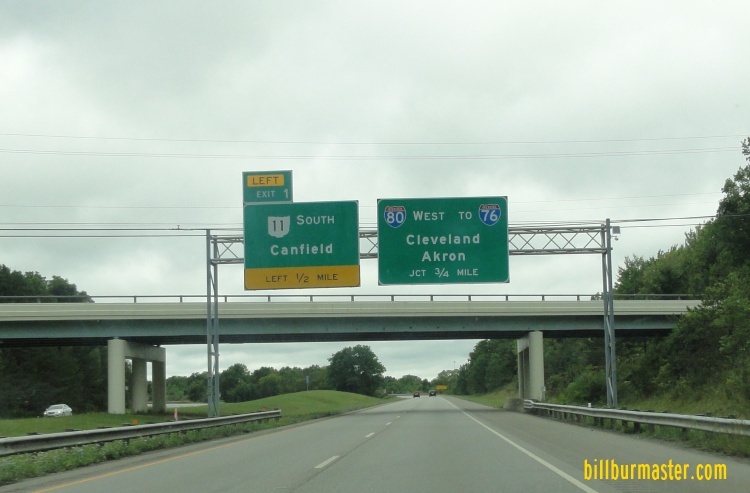 From the Pennsylvania/Ohio State Line to near North Jackson, this runs along the Ohio Turnpike. 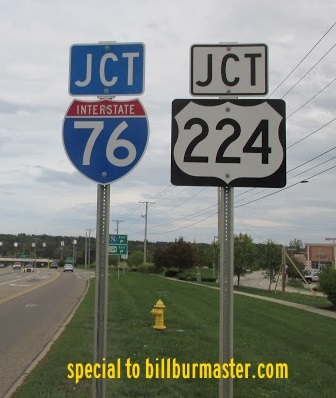 The western end point is at Interstate 71, near Seville. 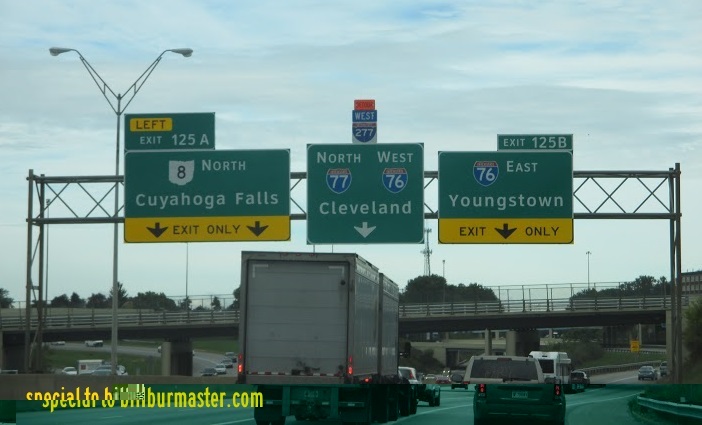 While in Ohio, I-76 is multi-plexed. ...U.S. Rt. 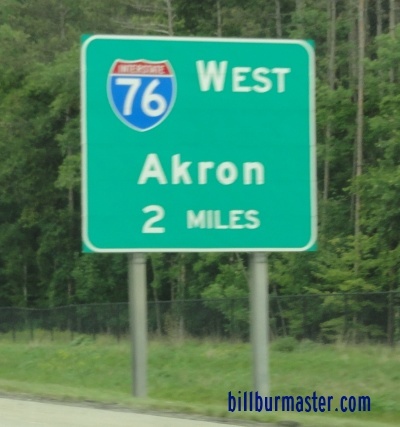 224, from near Akron to near Seville. 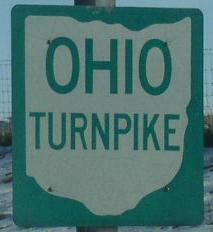 Info on the Ohio Turnpike. 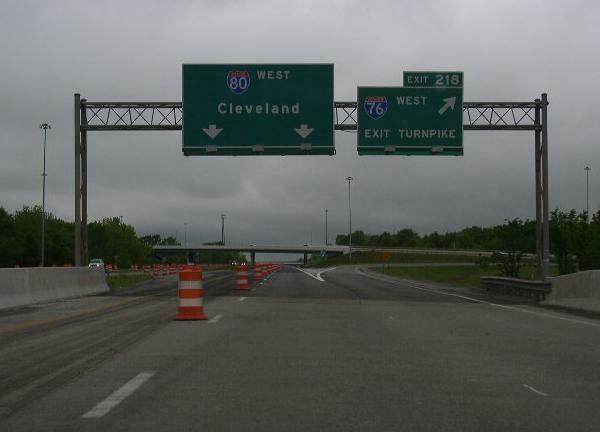 Interstate 76 crosses the following interstates in Ohio. 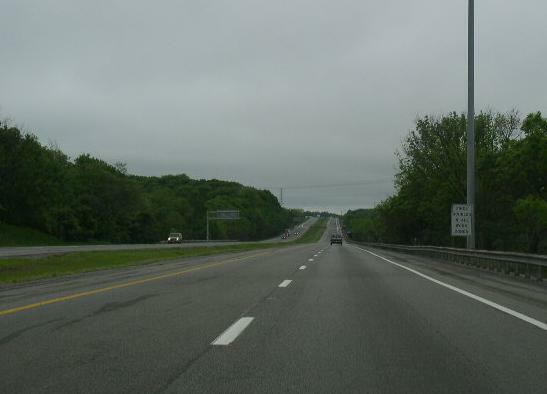 Interstate 680, near North Lima. 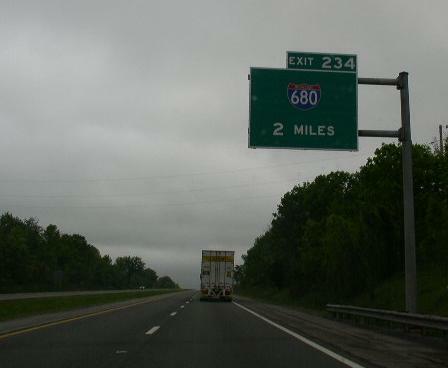 The 2 mile BGS on WB I-76. 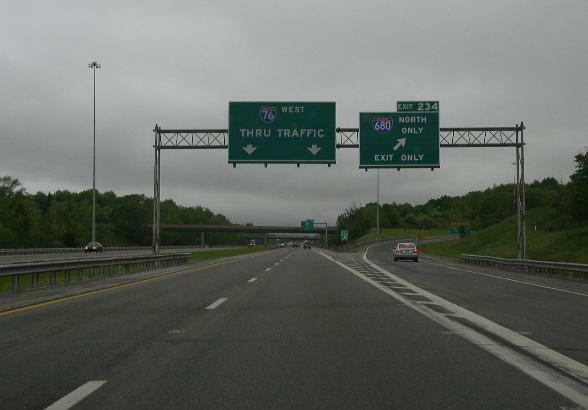 WB I-76 one mile from I-680. 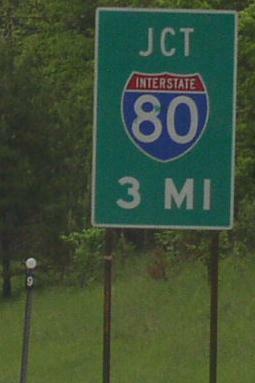 Interstate 80, near North Jackson. 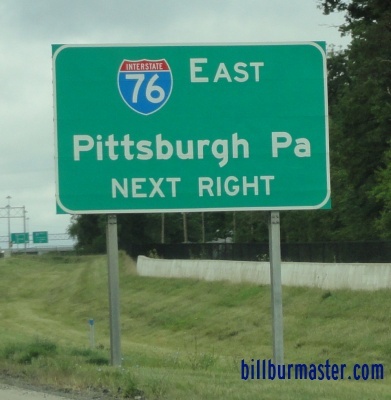 A 3 mile sign on WB I-76. 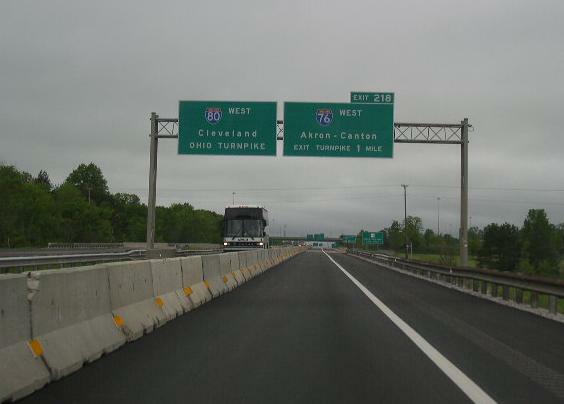 A 1 mile BGS on WB I-76. A 1/2 mile BGS on WB I-76. EB I-76 one mile from I-80. 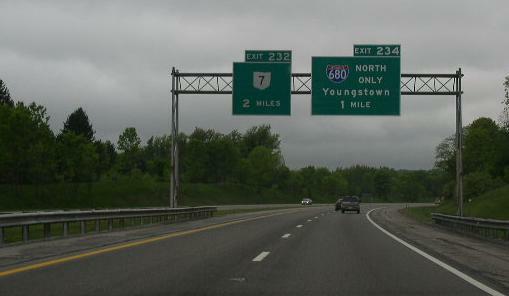 A junction marker on EB OH St Rt 261. 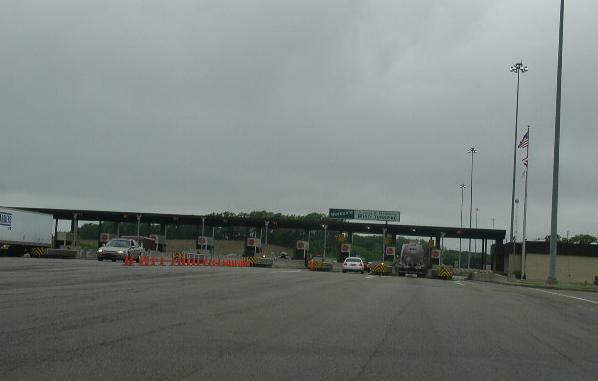 Toll Plazas on I-76 in Ohio. 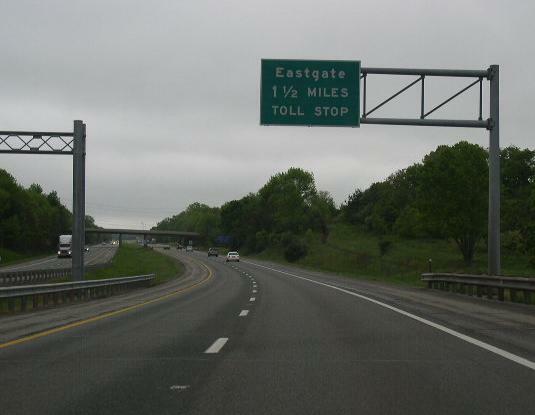 Eastgate, near Petersburg. 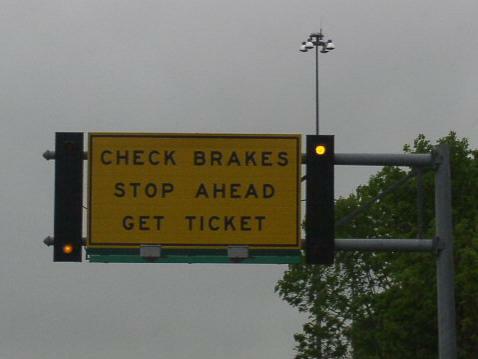 WB-Get Ticket; EB-Pay Toll. 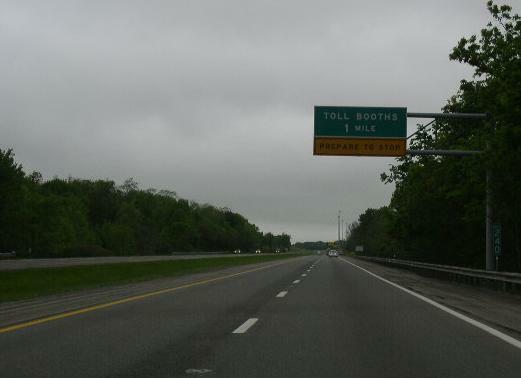 The first toll warning sign on WB I-76. 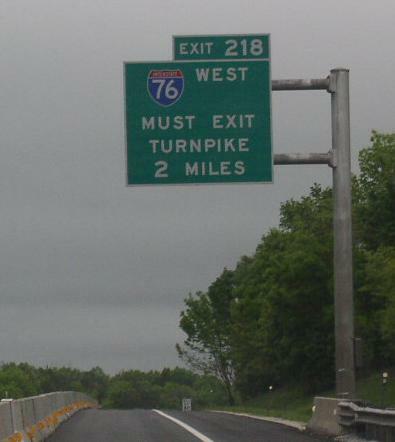 The one mile warning sign on WB I-76. 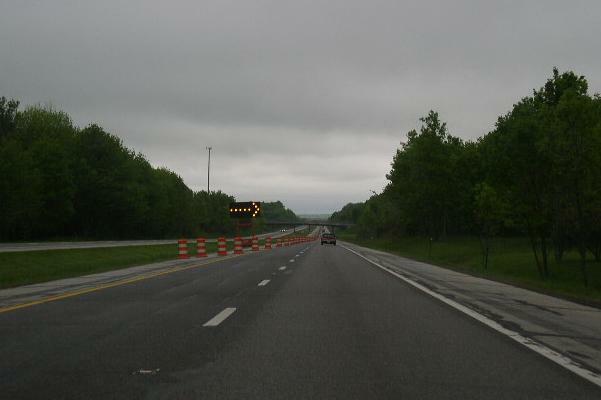 The stop ahead sign on WB I-76. 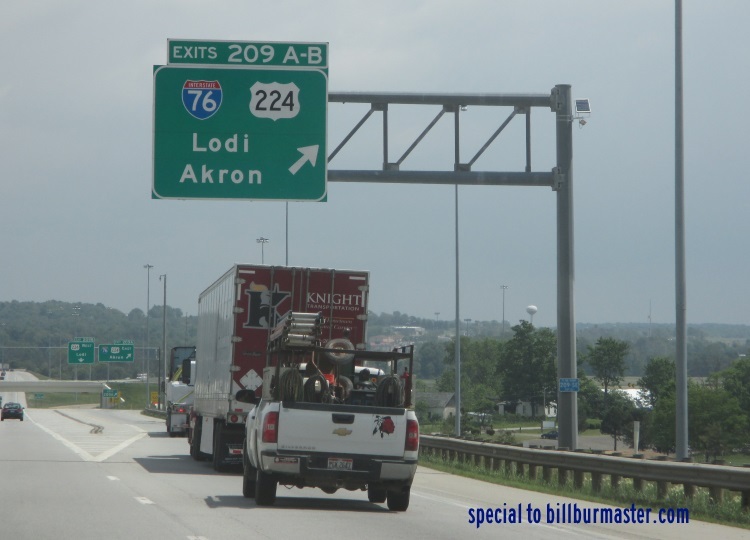 Another stop ahead sign on WB I-76. The Eastgate Plaza on WB I-76. 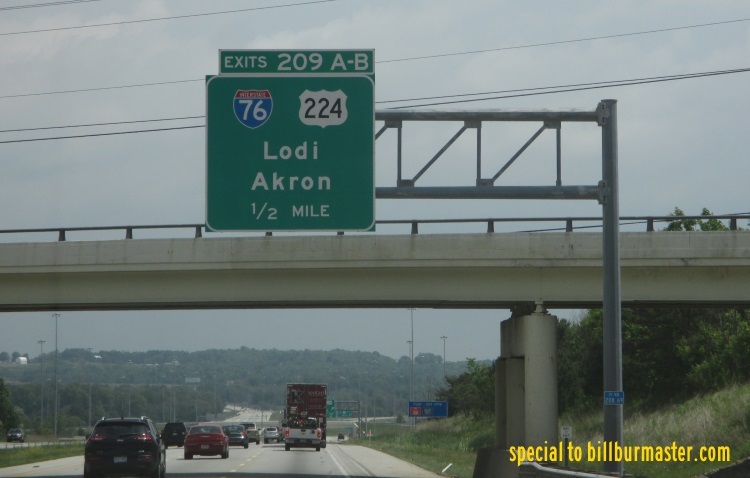 There are no branches of I-76 in Ohio. 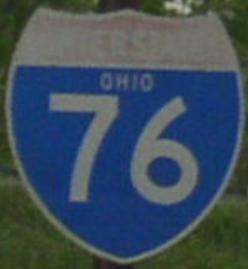 WB I-76 at the Ohio/Pennsylvania State Line. 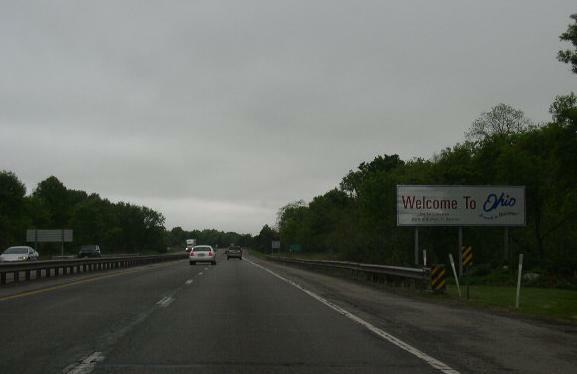 WB I-76 near New Springfield. 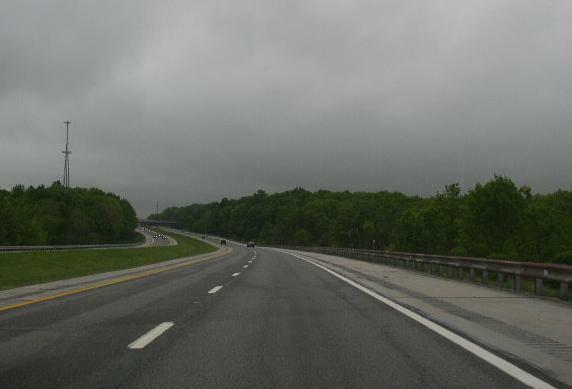 WB I-76 near North Lima. 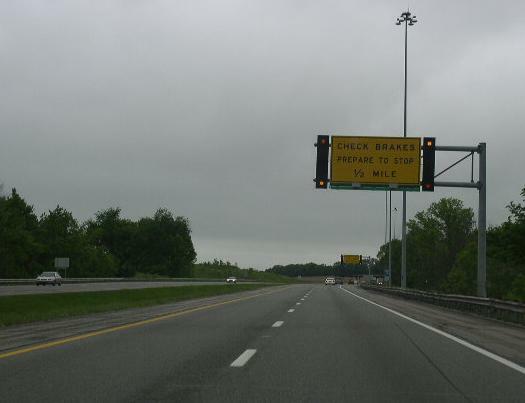 WB I-76 east of Canfield. 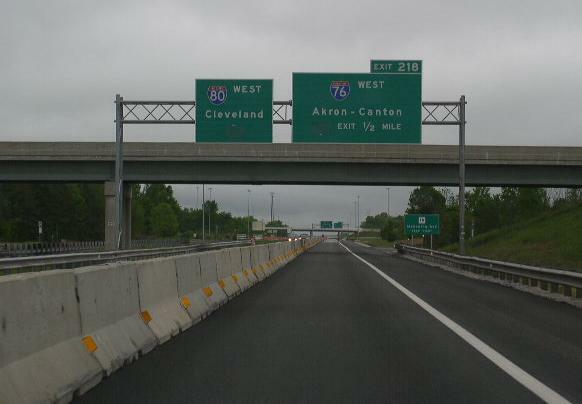 WB I-76 north of Canfield. 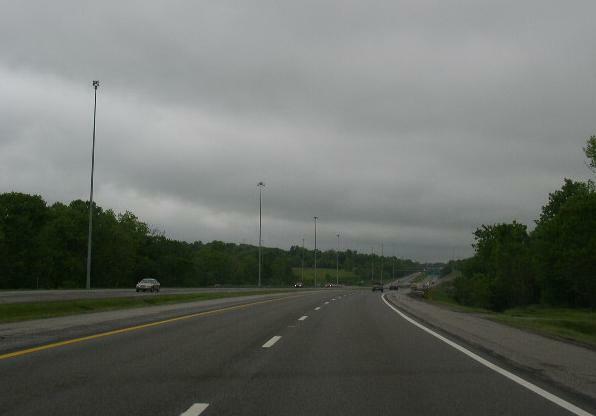 A BGS on NB I-680.